These adjustable literature holders can display publications with widths up to 8.5" wide yet are able to accommodate smaller materials, like 4" x 9" pamphlets too. The versatile design ensures that the information dispensers will be effective when used at businesses, offices, visitor centers, and especially trade show events. 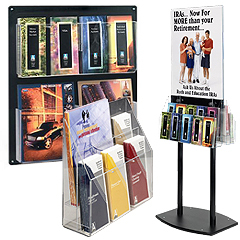 Each literature display features pockets with wire or acrylic dividers that can be inserted or removed depending on the type of printed material. In some cases, users can showcase both narrow trifold and wide letterhead-sized information on the same rack! 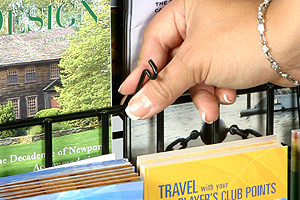 The literature holders, sometimes called information dispensers, are outfitted with many unique and practical features to help pass out important sales or reference materials. 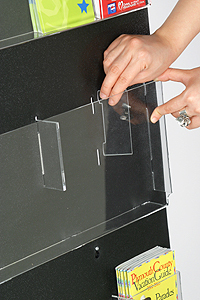 Some designs are rotating, while others feature a basic acrylic box assembly or a complete floor stand with a poster frame. These are just a few of the many literature displays available in our online catalog. Browse by material or the type of publication to find the right model for your application. What makes these information dispensers so practical for trade show and business promotion? 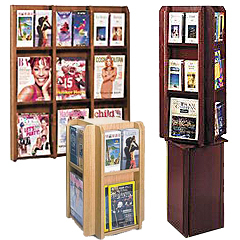 The literature racks are ideal for promoters and advertisers that frequently change or update their publications. For some campaigns, the user will need to present potential clients with a collection of company catalogs. Other campaigns require product detail pamphlets with specifications. Still, other circumstances will call for the display of a combination. Trade show vendors and expo booth attendents really love the flexibility of the adjustable pockets. Although there are countertop, wall mount, and freestanding literature racks, each pocket adjusts the same way. As mentioned above, wire hooks or plastic divider pegs are used to change 8.5" x 11" pockets to fit 4" wide x 9" tall pamphlets and vice versa. The dividers are inserted or removed with ease, so passing out different sized information can be done very quickly. Some of the most popular literature stands feature many adjustable pockets, so they can accommodate several different materials simultaneously. This way, users can situate product catalogs right alongside relevant brochures, which is great for generating interesting in a brand, selling goods/servies, or simply educating visitors. Most of the pockets on the information dispensers are made out of acrylic. We only use high-grade materials to ensure that these rotating and stationary compartment organizers will serve you for many years to come. Literature stands and pamphlet racks are even more effective with the addition of a sign. Many of these selections are outfitted with built-in sign frames, which come in sizes that fit small advertisements to large posters. Imagine the potential of your trade show booth or retail store presentation when you showcase a large sign alongside a magazine or other literature collection. Customers and interested bystanders will inevitably be drawn in from a distance by the large graphics. Once they are next to the display, they are able to quickly grab the information or magazine they need from the plastic or acrylic pockets. There are so many applications and different ways to use these publication dispensers. Pick a rotating model for your checkout counter to distribute hand-outs or select a floor stand with a sign holder to call attention to specific merchandise in your showroom. Wall mounted systems are great for busy offices and small locations that lack floor space. 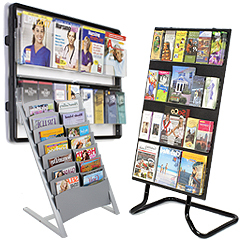 Add any of these magazine display racks to your office or lobby to keep all your reading materials in order. Ensure that your countertops are cleared of clutter, so customers and visitors are always comfortable. With so many great options, it is easy to choose the model that suits your application. From basic plastic pockets to full-blown sign & literature combination systems, we have it all!